Built by John Brown & Company, Clydebank, Scotland, 1907. 31,550 gross tons; 787 (bp) feet long; 87 feet wide. Steam turbine engines, quadruple screw. Service speed 25 knots. 2,165 passengers (563 first class, 464 second class, 1,138 third class). Built for Cunard Line, British flag, in 1907 and named Lusitania. Liverpool-New York service. Torpedoed and sunk off the Irish coast; 1,198 lost in 1915. 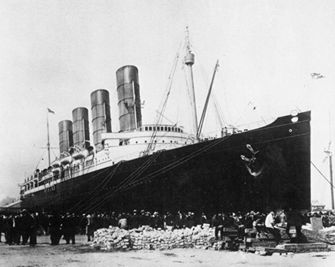 Lusitania, liner under British registration, sunk off the Irish coast by a German submarine on May 7, 1915. In the sinking, 1,195 persons lost their lives, of whom 128 were U.S. citizens. A warning to Americans against taking passage on British vessels, signed by the Imperial German Embassy, appeared in morning papers on the day the vessel was scheduled to sail, but too late to accomplish its purpose. The vessel was unarmed, though the Germans made a point of the fact that it carried munitions for the Allies. The considerable sympathy for Germany that had previously existed in the United States to a large extent disappeared, and there were demands from many for an immediate declaration of war. President Wilson chose the course of diplomacy and sent Germany a strong note asking for “reparation so far as reparation is possible.” Germany refused to accept responsibility for the act in an argumentative reply, but issued secret orders to submarine commanders not to attack passenger ships without warning. After prolonged negotiations, Germany finally conceded its liability for the sinking of the Lusitania and agreed to make reparations and to discontinue sinking passenger ships without warning. The immediate crisis between the United States and Germany subsided. The incident, however, contributed to the rise of American sentiment for the entry of the United States into World War I. See A. and M. Hoehling, The Last Voyage of the Lusitania (1956); C. L. Droste, The Lusitania Case (1972); C. Simpson, The Lusitania (1973); T. Bailey, The Lusitania Disaster (1975).